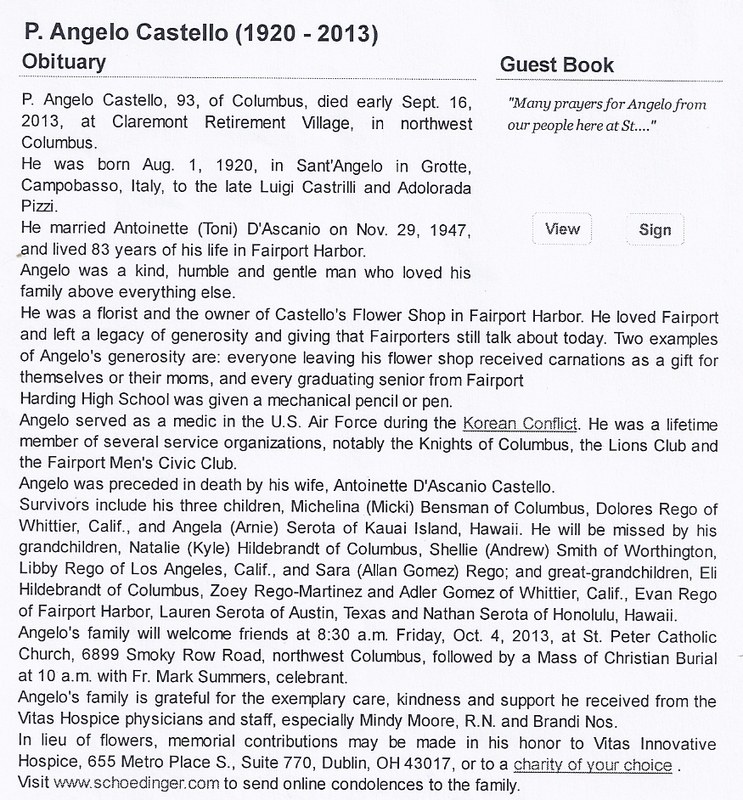 Angelo Castrilli first appears at Fairport Harbor, Lake County, Ohio, in the 1940’s. In America, Angelo Castrilli was known Angelo Castello. Mr. Castello was a kind, humble and gentle man who loved his family above everything else. Angelo Castrilli, son of Luigi Castrilli and Addolorata Pizzi, was born on Sunday, August 1, 1920, at Sant’Angelo in Grotte, Italy. Angelo married Antionette D’Ascanio, daughter of Filippo D’Ascanio and Michelina Ostoma, on November 29, 1947. Angelo died on September 16, 2013, at Claremont Retirement Village, Columbus, Franklin County, Ohio, at age 93. Angelo Castrilli immigrated to the United States on July 11, 1934, at age 13. He was travelling to 1430 Center Street, Mentor, Lake County, Ohio. Angelo was accompanied by his father, Luigi Castrilli. Luigi had previously established residence in Mentor. 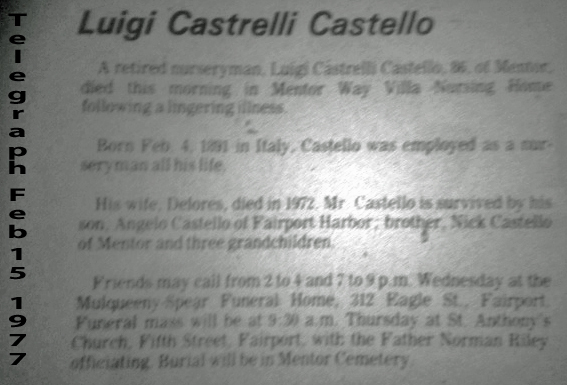 Luigi Costillo and his son, Angelo, were enumerated for the 1940 Federal Census as living at Mentor, Lake County, Ohio. Angelo served as a medic in the U.S. Air Force during the Korean Conflict. Angelo was a florist and owner, with his wife, of Castello Flower Shop in Fairport Harbor. Mr. Castello’s parents, Luigi and Addolorata Pizzi Castrilli lived in Mentor, Ohio. His uncle, Nicola Castrilli also resided in Mentor. Angelo was probably related to Painesville Itailian Giovanni Castrilli.